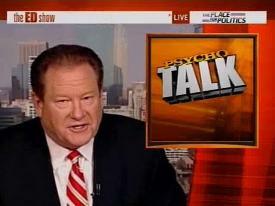 Ed Schultz Wants To Be In MSNBC Promos Or He'll "Torch This F*cking Place"
Seriously, people, who took Ed Schultz‘s stapler? New York Post‘s Page Six reports the MSNBC host, whose 6pmET show features a segment called “Psycho Talk,” had an epic meltdown earlier this month after being left out of MSNBC promos about the election coverage. The hot-tempered anchor of “The Ed Show” lost it during a phone call in the packed studio and slammed down the phone before exploding. For an example of what this might have sounded like, check this out. The Post reports this happened August 12 – Schultz was on the air that night and the next, but was out the following week. A source told Page Six Schultz was reprimanded, told he would be fired if it happened again and “he broke down crying.” Also, “a spokeswoman for Schultz and the network declined to comment on the incident but said, ‘The only thing that’s on fire are Ed’s ratings, and the only people crying are at CNN. '” As a side note, this new CNN vs. MSNBC battle is surprising and enjoyable. Wait until things heat up in the fall when Eliot Spitzer, Kathleen Parker and Piers Morgan (probably) are involved!